Have you found that while your athletes are consistently getting stronger, they are not gaining agility? If so, you might want to consider adding footwork and running drills to their workouts. Doing this will not only make your athletes faster, but also give them more power and endurance. When implementing agility drills, one of the best instruments to use is a cone. Affordable and easy to transport, cones can add variety to any workout. Unfortunately, some coaches associate cone drills with football, and many of the exercises actually have football in their name. However, Matt Rhodes, Head of Strength and Conditioning at Morehead State, found that none of them are truly sport-specific. After four weeks of applying these drills to the workouts of the softball team at Morehead, both players and coaches noticed great improvement in how the athletes looked and moved. In an article for Livestrong, personal trainer Joe King echoes the sentiment that these drills can help athletes adapt to the fast-paced environment of any sport. According to King, having athletes run to cones in different patterns can increase their speed, as they are training the skeletal muscles to contract quickly. While building speed, cone drills can also help athletes increase their balance and coordination. 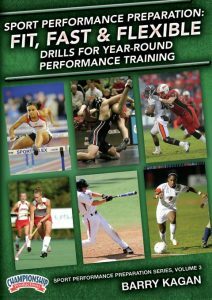 Beyond speed and agility, cone drills can also make your athletes more explosive. This can be done by making sure athletes are pushing off of each turn as hard as possible or even having them jump over cones at progressively higher platforms. And while it may seem like these drills are aimed only towards short bursts of energy, they can also help athletes build endurance. This drill is good for improving quickness in confined spaces. It should be done for approximately 10 seconds per set, and athletes should do two or three sets. Set up four cones in a square with sides approximately 6-10 feet long. Number the cones one through four. The athlete assumes an athletic position in the center of the box. Specify whether the athlete will touch each cone with a specific hand or just using the closest one. With either a hand signal or out loud, the coach will give the athlete a number. The athlete will run, backpedal, or shuffle to the specified cone and touch it. The athlete sprints back to the starting position. This drill will help athletes learn how to rapidly adjust stride and foot placement to change into other movement patterns. Set up four cones in a the shape of a Y. The two cones at the top of the Y and the base cone should be placed about 10 yards from the middle cone. The cones should be numbered as follows: base cone—1, middle cone—2, top cones—3 & 4. The coach stands in front of cone 2, inside the V at the top of the Y. The athlete assumes a sport-specific position at cone 1. At the coach’s designated signal, the athlete sprints to cone 2. The coach then directs the athlete to which of the three other cones he or she should sprint to next. Coaches can modify this drill by having athletes backpedal or side shuffle to the designated cone. Adam Linens, MS, CSCS, ATC, PES, CES, is an Assistant Strength and Conditioning Coach at the University of Oregon, working specifically with the men’s basketball team. He has also worked with the NBA’s Atlanta Hawks and Cleveland Cavaliers and the WNBA’s Atlanta Dream. Below he answers questions on training speed and agility. What’s your overall philosophy regarding speed and agility? Linens: In my experience, all athletes want to do is go fast. But speed and agility training is not about how fast a player can accelerate, it’s about how fast they can stop and then reaccelerate multiple times. When NBA players get to the final years of their careers, they have no problems starting—they have problems stopping, landing, and changing direction. Those skills require the most eccentric strength, so I try to instill them early in my players’ careers. That being said, much of what I teach is based on linear speed development. Although basketball athletes don’t need a ton of linear speed training—since they play a change-of-direction sport—good technique for linear speed will transfer to change-of-direction work and other movements. How do you improve speed and agility? Linens: I like to use ladders and hurdles to instill proper balance, body positioning, linear speed, and lateral quickness. We start with specific ladder drills to teach forward-to-backward change of direction, hip rotations, and pivoting. Then, I’ll get into more advanced drills with hurdles and cones. After that, we progress to reactionary training, where I use numbered cones, colored cones, or pointing in different directions to get athletes to react. During these sessions, I also like to use lateral resistors around their ankles to strengthen their hips. What role does technique have in speed and agility training? Linens: Technique trumps everything. Some coaches overload athletes with repetitions or resistance when their movements aren’t correct to begin with. This only ingrains bad habits. Instead, I’ll teach a drill and make sure athletes have good technique before moving forward. After they’ve gotten proficient in the drill, we’ll add some resistance. However, I don’t add so much resistance that it makes the movement look sloppy. My general rule is: The more sport-specific a drill, the lighter the resistance. How do you make speed and agility training sport specific? Linens: I take the sport, break it down into different movements, and then teach corresponding pieces of it through a drill. I’m not teaching basketball skills, but our speed and agility training can focus on footwork related to an open step or crossover step that will help players drive to the basket or shuffle on defense. What role does strength training play in your speed and agility work? Linens: Strength training enhances speed and agility, and speed and agility enhance strength training. If you think of different concentric and explosive speed movements, they all require triple extension. We focus on triple extension in a lot of the exercises that we do, such as squat variations, dumbbell variations, kettlebell swings, arm dumbbell snatches, and clean variations. To enhance change of direction, we emphasize single-leg exercises in the weightroom. I try to get athletes comfortable with balancing, exploding, controlling, and decelerating on one leg. Some of our exercises include variations of step-ups and lunges, single-leg Romanian dead lifts, and rear-foot elevator squats, as well as dumbbell split jerks. The 60-yard sprint is a great way to measure speed and assess running mechanics. Longer than most typical sprints, it challenges athletes in different ways and will help you identify where their running needs to improve. The following tips from Nick Brattain in a blog for the International Youth Conditioning Association, outline how to get the most out of this exercise. Many athletes lack proper front side mechanics when they get into an upright running position. Front side mechanics refers to the movements that occur in front of the body during running, which includes the knee driving up and down, as well as the arm swinging in front of the body. More time is spent in the upright position during the 60-yard sprint compared with other shorter sprints. Therefore, coaches need to take time during training to help athletes perfect these important mechanics. Poor transition into the upright position can result in improper balance and tilt in the hips. This can limit the knee’s ability to drive and reposition, which will in turn limit the amount of force an athlete can exert with each stride. Athletes should also avoid rotating their hips from side to side as they plant each foot. This will put excessive force and stress on the hips and lower spine. Athletes will need to build the necessary strength in order to maximize their linear sprinting ability. Some athletes are more agility based and will have a tougher time sprinting in a straight line for 60 yards. Consider the sport and position of each athlete, and identify the muscles they will need to strengthen in order to improve their running mechanics. If they have muscular weaknesses, their sprinting will suffer. Especially with a longer run like the 60-yard sprint, many athletes lack the endurance to finish the sprint strong or do multiple reps. Sprint endurance refers to an athlete’s ability to reach maximum velocity and maintain it for a set period of time before decelerating. Ideally, athletes will be able to maintain maximum velocity until the end of the sprint and then continue to do this for multiple reps. But it usually takes some work to get there. Here are three simple effective med ball drills that can be used to work on explosiveness. While designed for a NCAA Div 1 basketball team, these exercises would be appropriate for many different athletes. In the video clip below Brian Bingaman, St. Joseph’s University Director of Strength and Conditioning; named a Master Strength & Conditioning Coach by the Collegiate Strength and Conditioning Coaches Association (CSCCA), as well as Strength & Conditioning Coach Certified (SCCC), and (Level 1 Club Coach) United States Weightlifting, demonstrates three med ball drills that he uses with the St Joseph’s Mens Basketball team. The drill begins by placing 6 mini-hurdles approximately two feet apart. The athlete will begin facing the hurdles with a medicine ball in both hands. The athlete should begin with the ball at approximately chin height. He will explode up over the mini-hurdle and extend the ball up over his head. The effort should be maximum with the goal to get the ball as high as possible. The athlete should execute proper landing mechanics. The feet should not be to narrow or to wide, but properly balanced. The coaching cue is to land soft or quiet. They should be finishing through their toes. Upon landing the ball should return to chin height. Then with minimal dipping of the knees the athlete will explode up and over the next hurdle. Coach Bingaman offers two simple variations. Next he has the athlete proceed through the mini-hurdles laterally. Taken note to complete the same number of reps facing each direction. In the third variation he has the athletes execute a quarter turn when the jump in the air over the hurdles. The should execute a 90-degree turn each time the jump. The YouTube video below has audio, so please make sure that your sound is turned up. Note that some schools block access to YouTube. If you are having trouble viewing the clip from school, contact your network administrator.